‘Internationalisation’ is a key theme in the Committee on the Future Economy (CFE) report released by the Singapore government earlier this year. It encompasses the internationalisation of people, as well as enterprises. With the growth of the digital economy, overseas market presence may be physical, digital or both. The government has been taking a number of steps to help local companies with strong growth potential to scale-up and expand to global markets. 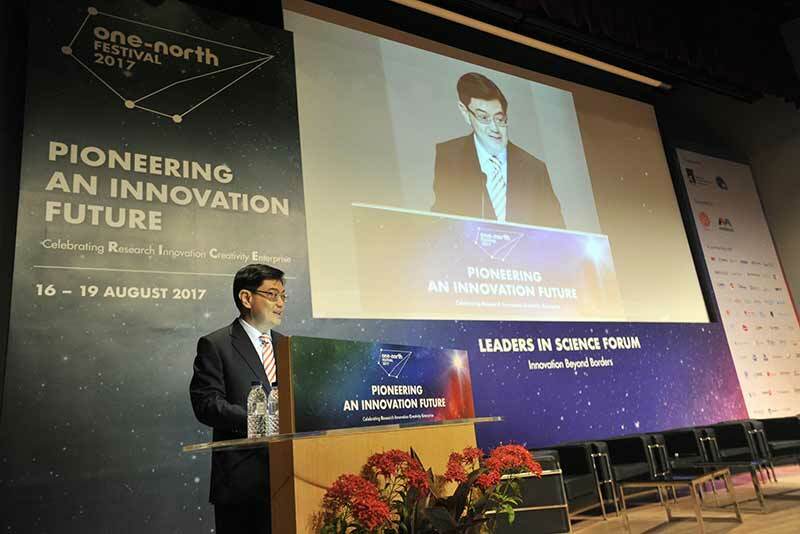 Speaking at the Leaders in Science Forum on August 16, Minister for Finance, Mr. Heng Swee Keat, described how Singapore’s public agencies, research institutions and universities are helping local companies gain access to overseas resources, networks and markets, in line with this year’s theme of “Innovation Beyond Borders.” The objective is to build a strong innovation ecosystem where entrepreneurs have the capabilities to develop new solutions and create new value across sectoral and geographical borders. We look at the steps outlined by Minister Heng in his speech and other programmes and initiatives OpenGov has reported on previously. For smaller enterprises which may have limited resources for R&D or those that want to accelerate product development, IPI (established under Singapore’s Ministry of Trade and Industry), a SPRING Singapore affiliate, connects Singapore-based businesses with local and overseas solution providers to enhance innovation capability. Around half of the 750 technologies in the IPI Portal are from overseas technology providers. During the last 5 years, IPI has facilitated over 500 technology matches, of which 40% involved overseas providers. At the same time, using patent analytics, the Intellectual Property Office of Singapore (IPOS), helps local companies gain better insights into the value of their IP and emerging technology white spaces in the international market, on which they can capitalise. In April, IPOS signed a Memorandum of Understanding (MoU) with the Singapore Business Federation (SBF) to help SBF’s 25,000 member companies to build IP awareness and competencies. They will also gain direct access to IPOS’ suite of IP services, such as training, executive education and complimentary IP clinics. Plans were announced for collaboration between IP ValueLab, the enterprise engagement arm of IPOS and EverEdge Global Ltd, an international IP management consultancy firm. As part of the collaboration, 150 local innovative enterprises will be provided intensive and customised assistance on IP strategy, management and commercialisation over the next three years. To deepen overseas networks, the government is setting up the Global Innovation Alliance (GIA) to form partnerships between local enterprises and overseas business communities in major innovation hubs and markets with a focus on technology and innovation. The GIA, which was announced in the Budget 2017 speech, aims to help Singaporean workers gain overseas experience, build international networks and create opportunities to collaborate with innovative overseas counterparts. The Global Innovation Alliance has three components: the Innovators Academy, Innovation Launchpads, and Welcome Centres. The Innovators Academy will build on the existing National University of Singapore (NUS) Overseas College programme and expand it to other Singapore universities. The NUS Overseas College programme connects students with overseas start-ups and help to build connections and their overseas capabilities. The Innovators Academy hopes to grow its intake to 500 students in the next five years. Innovation Launchpads are being established in selected overseas markets to create opportunities for entrepreneurs and business owners to connect with mentors, investors, and service providers. Welcome Centres aim to help link up innovative foreign companies with Singaporean businesses to co-innovate, test new products and expand into the region. Last month, Mr. Lim Hng Kiang, Singapore’s Minister for Trade and Industry (Trade) launched BLOCK71 Jakarta, a co-working space for tech startups, to catalyse partnerships among startups from Singapore and Indonesia. NUS Enterprise, the entrepreneurial arm of NUS partnered with the Salim Group for this initiative. BLOCK71 Jakarta is modelled after BLOCK71 in Singapore’s entrepreneurial hub – JTC LaunchPad @ one-north. SGInnovate also connects local deep-tech startups with overseas entrepreneurs who can provide mentorship and support in launching products that cater to their respective markets. This OpenGov interview with Mr. Steve Leonard, Founding CEO of SGInnovate, details how the agency is working to build ambitious, globally relevant tech companies. For companies looking to expand overseas and promote their innovations internationally, IE Singapore’s Global Company Partnership Grant and Market Readiness Assistance schemes help defray costs of expansion and manpower development. In another example, SGInnovate BASH (Build Amazing Start-ups Here) announced a collaboration with EV Hive, an Indonesia-based coworking space, to build a landing pad for companies from Indonesia and Singapore to enter into each other’s markets. Startups in the pre-seed funding stage with great ideas face difficulties bringing these overseas. The government’s Innovation and Enterprise Offices, or IEOs, – such as the NUS Industry Liaison Office and NTUitive – and the commercialisation arm, Exploit Technologies Pte Ltd (ETPL) of the Agency for Science, Technology and Research (A*STAR), provide additional avenues of support (A*STAR is Singapore&apos;s lead public sector agency for economic oriented research). Minister Heng talked about ETPL’s “Venture co-creation” initiative, where ETPL works with private venture creators to identify viable business opportunities for the startup entrepreneur. At the same time, A*STAR provides the startup with IP licenses and helps to strengthen their technological capability. ETPL has started to work with a venture creator, Origgin, on startups that are keen on entering the Chinese or Southeast Asian markets. One of their projects is the co-creation of Sentient.io, a startup that is developing an Artificial Intelligence (AI) system which will be embedded into business applications. Using the AI, businesses can improve consumer experience and increase sales engagements by providing services such as chatbot and appointment scheduling functions. Sentient.io is also developing applications that can help the financial sector counter money-laundering and financing of terrorism. There’s another programme called Accreditation@IMDA (A@IMDA) launched by the Infocomm Media Development Authority (IMDA) in July 2014. Through A@IMDA, two things are being done: firstly, an assurance process, a deep dive where the government puts its reputation behind it and assure buyers and stakeholders that they can rely on these products. The next thing is to put these tech start-ups in front of the right buyers and stakeholders, which helps to shorten the whole sales cycle. The ultimate aim is to help these local companies make it big in the global arena. IMDA is now looking beyond government use cases to market access platforms into industries like finance (Memorandums of Intent or MOIs signed with DBS, UOB and OCBC) under the programme. In addition, IMDA recently signed a MOI with Singapore Exchange (SGX) to lower the barriers for IMDA-accredited companies to access capital markets. SGX will partner with A@IMDA to identify and galvanize key parties in the financial ecosystem, to support the accredited companies in their IPO journey, by lowering information barriers and costs for them. This includes facilitating pre-IPO funding, advising them on listing processes and preparing them for IPO listing. In a separate initiative, IPOS and home-grown private equity firm, Makara Capital, launched a S$ 1 billion fund in April to help innovators and enterprises translate their ideas into assets and support their expansion into world markets using Singapore as a base.